At Davam Urgent Care , we know the last thing you want to be doing when sick is sitting in a waiting room. In order to help you and your loved ones spend less time in the waiting room, Davam Urgent Care will now let you select an arrival time during our normal operating hours. Davam Urgent Care in Magnolia is open 8am-9pm daily. Davam Urgent Care in Giddings is open 8am-8pm Monday- Friday and 9am-5pm on Saturday and Sunday. Our online check in program will allow you to wait at work, home, or wherever else is most convenient for you and your family. With Davam Urgent Care in the Woodlands new online check in program you will have the ability to select an arrival time that works best for you. To reserve a time with one of our medical doctors click HERE.This website will allow you to select an available check in time that fits in with your day. After selecting a time and submitting the requested information, you will receive a text message letting you know your estimated visit time. The text message system will also allow you to reschedule your visit should you have any problems making it at the requested time. Please arrive 15 minutes before the reservation time to guarantee your spot in line. Walk-in patients will still be accepted at the clinic. 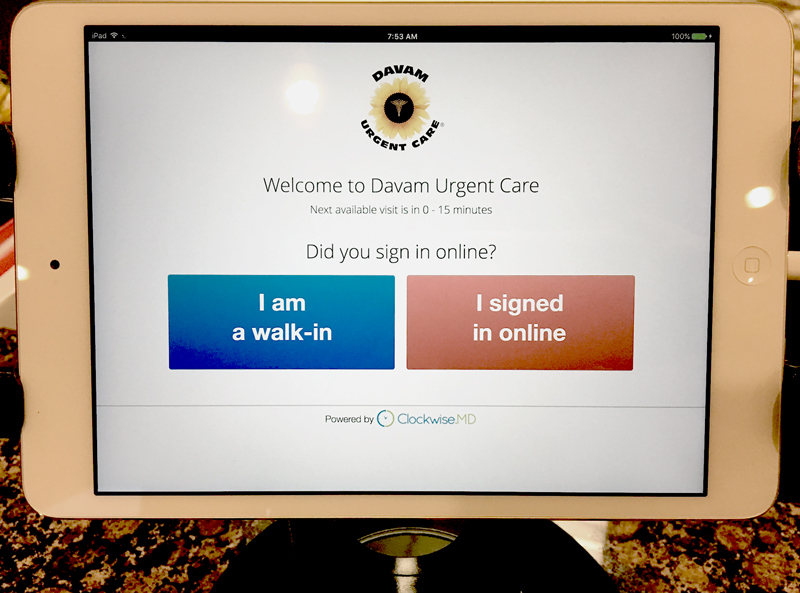 After arriving at Davam, walk in patients will also be able to use the check in system to estimate their wait time. Davam Urgent Care will make every attempt to see each patient at their scheduled time. However, due to emergencies, some patients may not be seen in the order they arrive. Text message notifications will be sent out if for any reason your reservation time changes. For more information on online check in in the Woodlands, TX , please contact our Magnolia clinic at (281) 583-1980 or the Giddings clinic at (979) 542-2273. Davam Urgent Care is open daily, including weekends and most holidays.